If your future includes a move to Cayucos, check out Meathead Movers! Our professionally trained student-athlete movers, moving concierge, and princess packers are prepared to get you safely moved into your new Cayucos home. 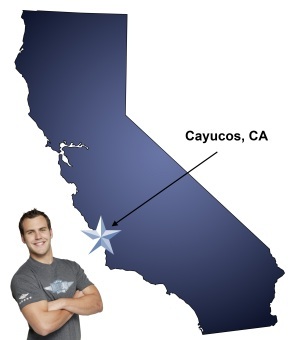 When you make your move to Cayucos, be sure to contact Meathead Movers. No matter what type of moving service you need, our student-athlete movers are ready to handle all your moving needs. Welcome to Meathead Movers of Cayucos! If you are moving to or from anywhere in Cayucos, we are the moving company for you! Our professionally trained student-athlete movers and our moving concierge service are here to help you with every stage of your move in Cayucos. Labeled as “America’s Coolest Small Town”, Cayucos has a lot to offer both its residents and visitors. With its beautiful Central Coast location, residents can enjoy a day at the beach whenever they please. Untouched by the noise and pollution of today’s modern cities, Cambria is the perfect escape from modern stresses. Despite being a small town, there is still plenty to do in Cambria. Residents and visitors can stroll through downtown Cayucos, take a step back in time at Cayucos’s western saloon, explore antique stores, hike along the bluffs, and explore beautiful ocean bluffs. Also, with its convenient location on Highway 1, popular central coast sights like Hearst Castle, Morro Bay, and Big Sur, are all just a short drive away. If you are considering moving to or from this area, Meathead Movers is here to help. Our moving company specializes in local, long-distance, and commercial moves to, from, and within Cayucos. We also provide reliable packing, storage, on-site relocations, and our distinctive moving concierge service, which connects you with local service providers. All our student-athlete movers are thoroughly screened and trained before their very first move. With branches not just in Cayucos, but all throughout California, we are your one-stop resource for all your moving needs, no matter where your California move takes you. In fact, you can see what your neighbors in Cayucos have to say about us! With our 100% satisfaction guarantee, the only thing you have to lose is the stress that comes from moving! So contact us today for a free no-obligation moving quote and to learn how we can help you on your next move! Moving to Cayucos? Here are some helpful resources. The move was well organized and took place as expected. We finished ahead of time. Fast and they wrapped all the furniture. Zach and Anthony were courteous and careful. Our only complaint is that we paid for 3 hours and used only one hour, so you service was expensive. If we use your service again, I would want to pay by the hour. Your movers are always gentlemen and hard workers. Your process is to be applauded. Everyone was fresh, friendly and part of the team. A lot of planning and organization results in optimization. I would not hesitate to recommend your firm. Even when they had difficulty getting the truck in our narrow driveway, the crew still kept at the job. The wrapped and staged everything in the garage so that when the truck was ready they could pack it with no extra time. They eventually had to site the truck next door, so the crew had to carry everything (including a piano) up our gravel driveway. They did not charge for the down time getting the truck in place. Carlos and his crew were very professional and a pleasure the whole time.